Portfolio is designed to be up and running in a matter of days and offers an extremely fast way for content creators to manage, tag, and then share even the largest collections of digital assets quickly and intuitively. Extensis® today announced the immediate availability of Extensis Portfolio™, a modular digital asset management (DAM) system that transforms the user experience and makes DAM affordable for companies of all sizes. With suggested, guided search capabilities, millisecond results, a sleek new user interface and elegant thumbnail views, Portfolio makes DAM intuitive and engaging for the everyday user. Portfolio’s elegant end user experience is matched by powerful administrative functionality. Requiring little to no IT support, Portfolio holds millions of assets in one catalogue or several, allowing the solution to be used by multiple departments. Companies can choose what they’ll use with Portfolio’s modular platform, offering options for mobile DAM, single sign-on, dynamic web portals and more. Additionally, Portfolio’s new RESTful API provides ease when integrating with other third-party business applications such as eCommerce Systems, Collection Management Systems, and Web Content Management Systems. “Increasingly companies around the world are generating more and more digital files with some creating hundreds of thousands- if not millions of digital assets. What makes the need for a digital asset management system even more demanding is the fact that an increasing percentage of this content is being created in volume on mobile- to be then published to other users, also on mobile,” said Richard Bamford, EMEA Business Director at Extensis. 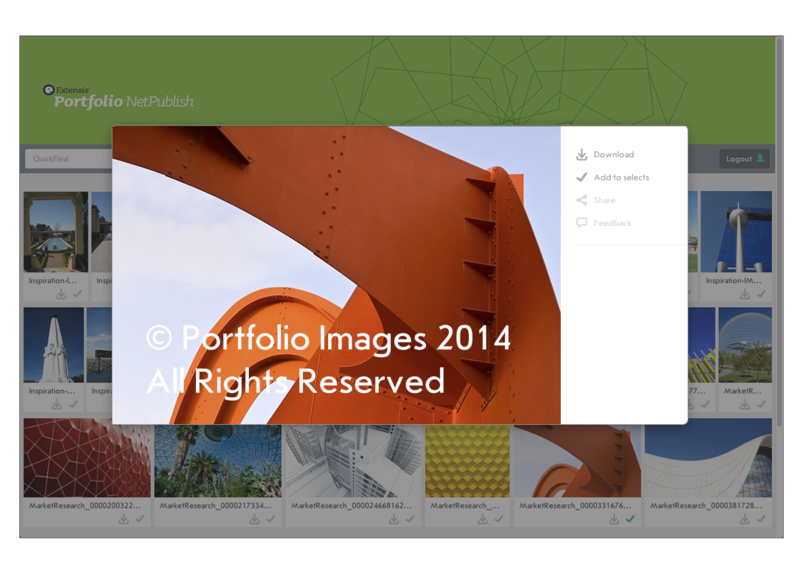 Refined User Interface: Portfolio presents a new and updated look and feel. 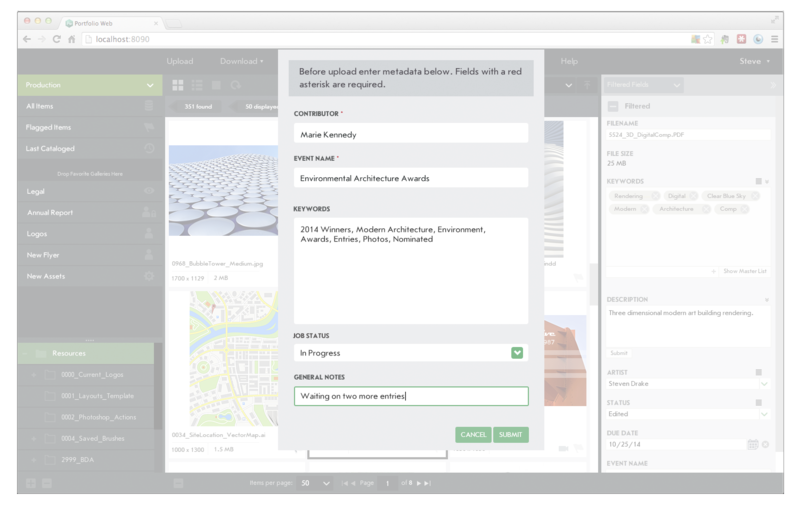 Asset focused views show both orientation and key metadata, presenting a rich and dynamic layout. 2000% Increase in Capacity: 10 million assets? No problem. Portfolio holds millions of assets in one catalogue or several. Administrators can also create read-only archives for legacy assets or silo restricted assets away. Suggested, Guided Search: Searching in Portfolio is intuitive. Users simply enter a few search characters and Portfolio automatically shows a listing of matching assets, aiding greatly in discovery and ease of use. Millisecond Search Results: Whether a company’s catalogue holds a few thousand assets or 10 million, searching yields results in milliseconds using ElasticSearch® technology. 500% Faster Cataloguing: Portfolio catalogues thousands of assets per minute. Automatic cataloguing watches locations users have designated and automatically catalogues, extracts and adds metadata for all found assets throughout their lifetime. Managed Upload: Portfolio allows administrators to define which key pieces of metadata must be entered by a user before assets can be uploaded, giving assets increased value. On-Premise or the Cloud: Companies can choose where to host their Portfolio solution, whether on-premise or in the cloud using Amazon Web Service™ (AWS), Google® or Microsoft® Azure™. Portfolio Flow® for Mobile – With the Portfolio Flow mobile app for iPhone®, iPad®, iPod touch®, and Android™ 4.x+, users can quickly and easily upload photos, videos and audio recordings with metadata while working remotely. Using a mobile device, a user selects, tags and uploads assets directly to Portfolio, making centralising assets a snap. 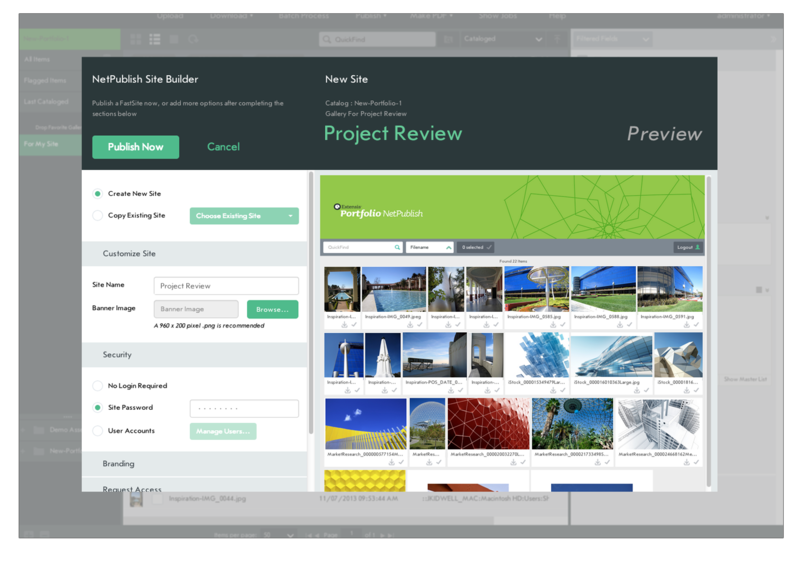 Portfolio NetPublish® – Collaborating and sharing with internal and external teams is a simple process with Portfolio NetPublish. Assets and metadata can be published to a dynamic site that can be accessed via browser, smart phone or tablet. Single Sign-On – Portfolio integrates with a company’s LDAP server and reduces the need for users to enter a username and password after they’ve logged into their computer. This reduces password fatigue and lowers IT interaction and cost. 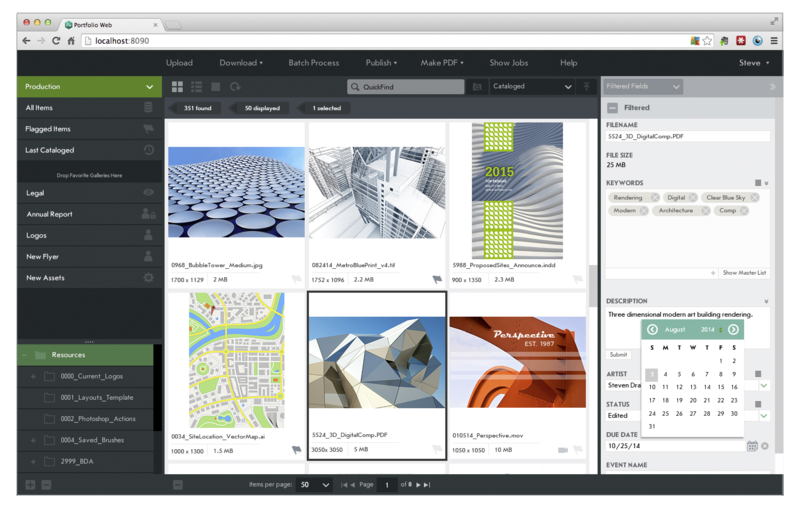 Portfolio Media Engine – Portfolio Media Engine brings substantially enhanced power and performance, coupled with extended file format and video conversion. For a complete list of features and additional information on Portfolio, visit http://www.extensis.com/portfolio. Portfolio is available immediately and starts from an estimated retail price of £716.00 GBP*. Competitive upgrade pricing is also available from a variety of qualifying products. Please email: 'switchers(at)extensis(dot)com' for more info. Portfolio is immediately available in English, French, German, Spanish, Italian and Japanese. With the explosion of digital assets and media over the past decade, companies across the globe are facing an increasing issue with how to keep them organised, accessible and everyone using the right versions. Inefficiencies are growing, with companies losing time and money trying to locate files. Portfolio ensures users have immediate access to the correct files in the desired format in a central location. It is the only digital asset management solution that is affordable, simple to use, can be setup within a day, and provides everything companies need to get started right out of the box. As a standards-based platform that works with other systems and existing workflows, Portfolio provides a single place to for teams to locate important files with consistent metadata information using a web browser or Mac and Windows desktop applications. Portfolio is ideal for anyone with large collections of images, videos, and marketing collateral. © Celartem, Inc. d.b.a. Extensis All rights reserved. Extensis and the Extensis logo mark, Suitcase Fusion, Portfolio Server, Portfolio NetPublish, Portfolio Flow and Universal Type Server are trademarks or registered trademarks of Extensis in the United States of America, Canada, the European Union and/or other countries. This list of trademarks is not exhaustive. Other trademarks, registered trademarks, product names, company names, brands and service names mentioned herein are property of Extensis or other respective owners. Amazon Web Services are trademarks of Amazon.com, Inc. or its affiliates in the United States and/or other countries. Google is a registered trademark of Google Inc. Android is a trademark of Google Inc.